It’s almost Spring!!! (or at least this is the lie I continue to tell myself :). 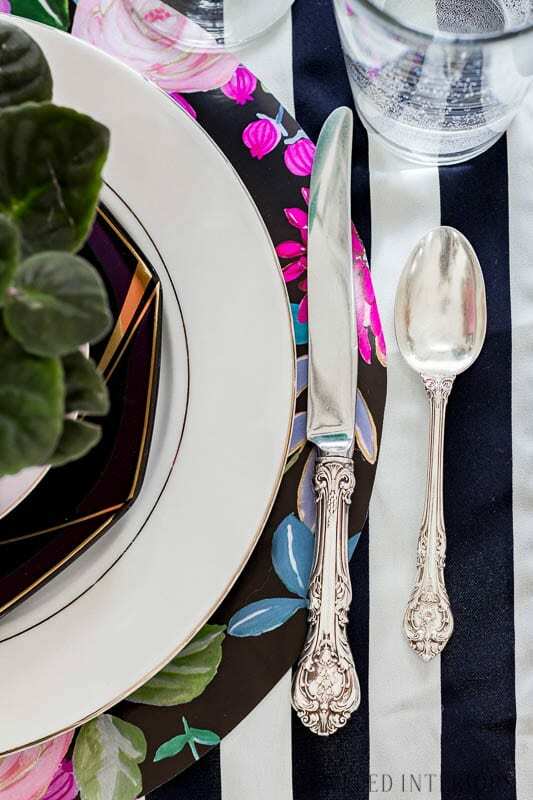 Ok, so maybe I still have another month or two until our New England trees start to bud, but that gives me plenty of time to get a jump start on a beautiful spring tablescape and other home decor. 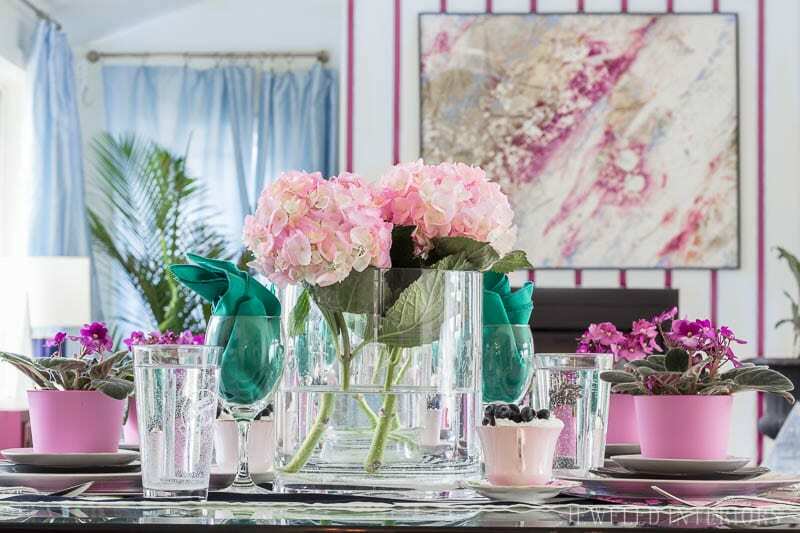 If you are joining me from the Spring Tablescape Blog Hop I hope you got to enjoy Domicile37’s spring space. 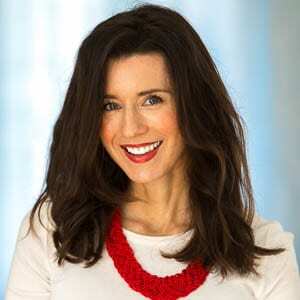 Jess has one of my favorite pieces of realestate on the blogosphere. If this is your first time here, then let me offer you a virtual hug and high-five. 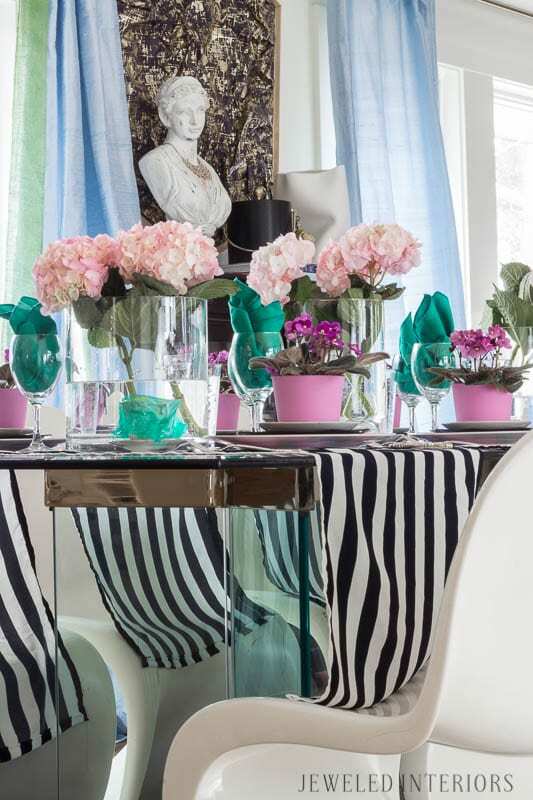 I really appreciate you taking the time to stop in and check out my eclectic glam rental. You may not believe me when I say it, but this is actually our 12th home. Yep, and we move again in 4 months- Seriously. Such is a the life a military family. The good news for me? I never run out of rooms to design…literally. The not quite as good news? I have to do said-rooms on a limited budget…Which means I have mastered the art of being both crafty and thrifty. Go ahead…poke around here and see what you think! 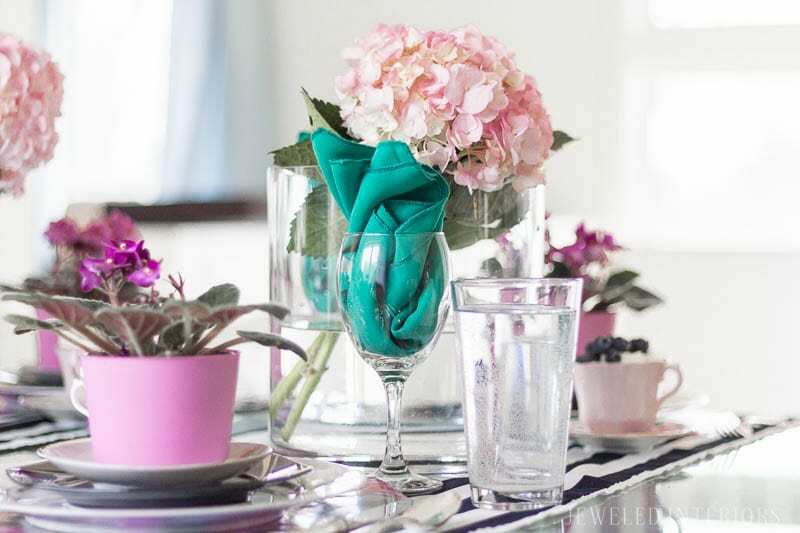 For this spring tablescape I wanted to reuse some of what I already had, but adapt it to our new home. 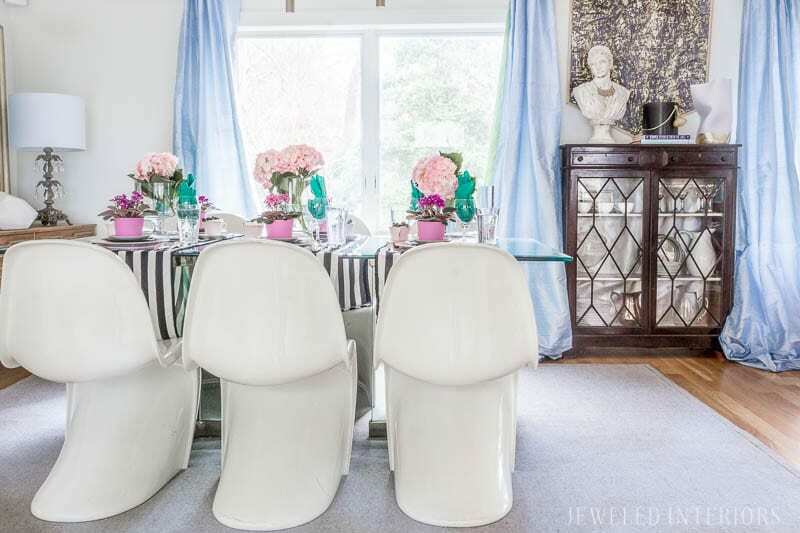 Click HERE to see a similar tablescape in our Idaho house a year ago. 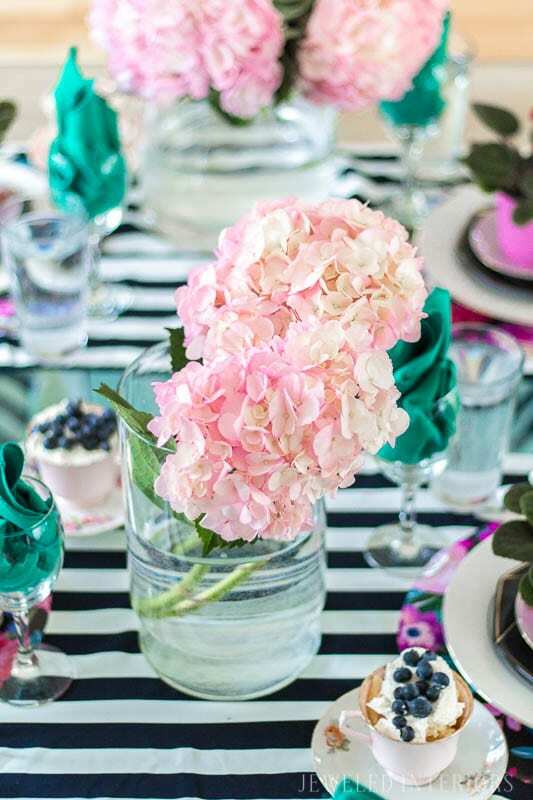 Like last year, bright springy colors and bold Kate Spade-like table runners were the inspiration and basis for this tablescape. 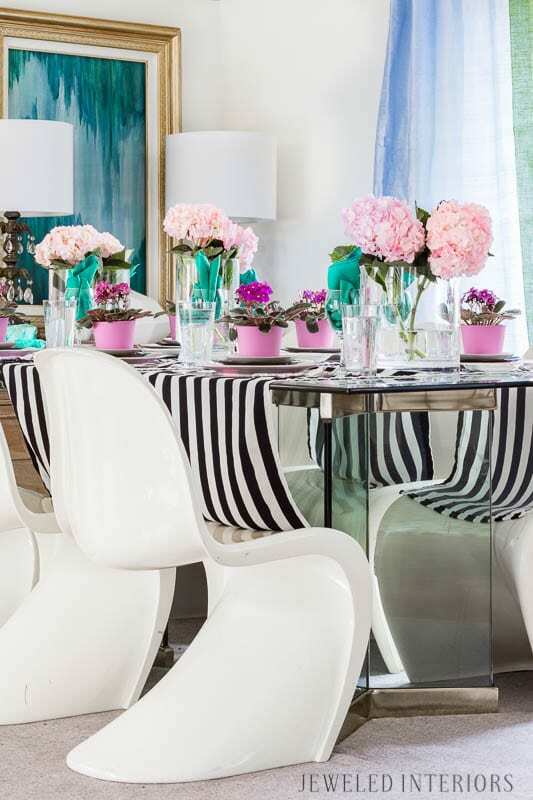 What amazes me though, is how similar tablescapes can look so different in different homes. Now that you’ve seen the table, let me break it down for you. 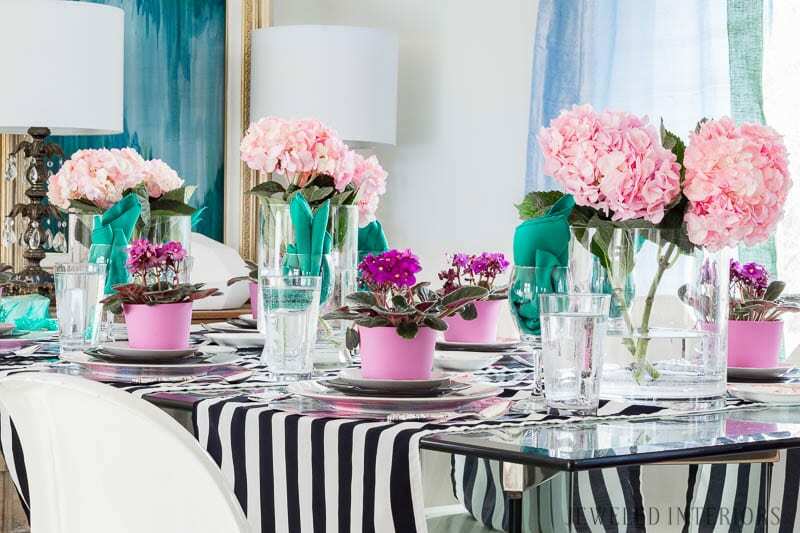 To make these table runners simply pick up at least 2 yards of 1-inch striped 54 in fabric from the craft store. Cut it into thirds and iron each seam over twice and sew it. Each runner is about 17-18 in wide. Yep, you read that correctly…CUT the placemats. I simply unrolled pretty wrapping paper from TJ Maxx and used a charger to measure and cut a 13 inch circle. This is a $4 solution to adding a subtle bit of pattern which tied my color scheme together. While most any pretty napkins would work, I picked up this set bright green pack of 10 from Amazon for about $15. 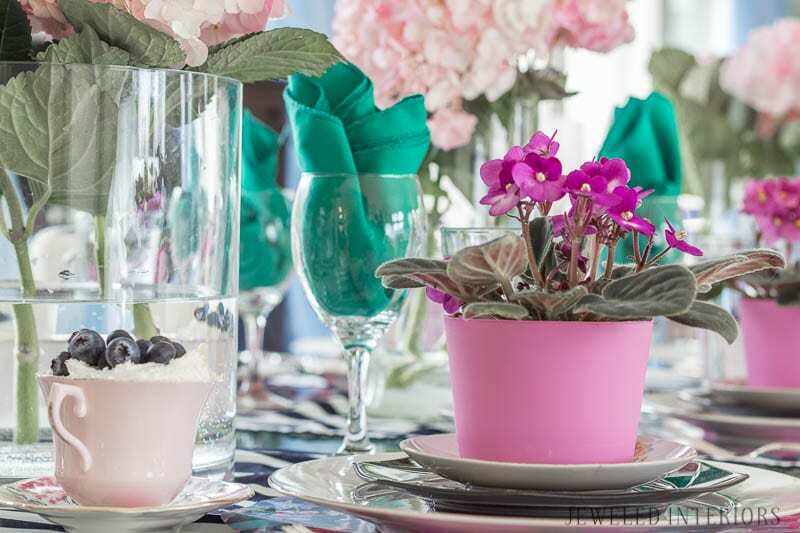 To save money and add longevity, I opted to mix potted plants into my tablescape tool kit. 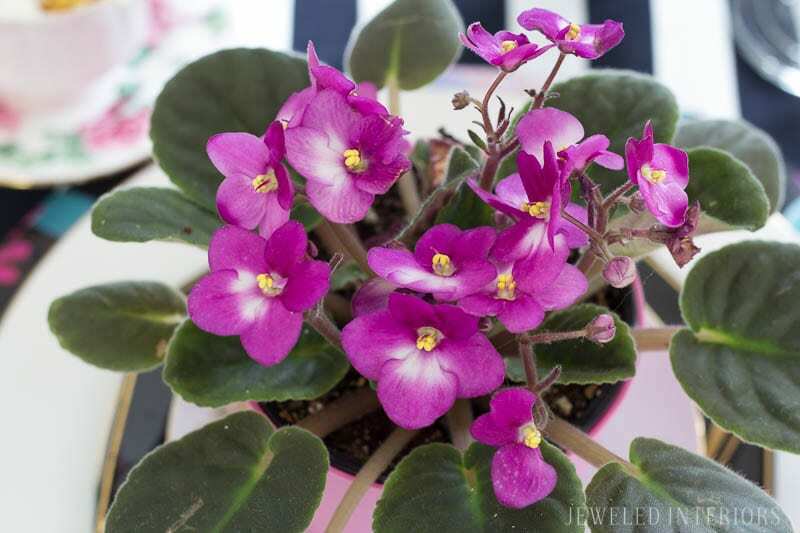 I have already used these African Violets for a Valentines party and they have transitioned nicely to Spring/Easter. Any bets if they will make it to my patio reveal in the next few weeks ? The take away for real life is that these inexpensive Walmart flowers are versatile and practical. Continuing with the longevity theme, I opted to use hydrangeas knowing that they will be around for a while. The trick to keeping them perky? A regular spritzing with a water filled spray bottle. They LOVE it! Vingtage teacups are the perfect way to serve layers of cake mixed with a Cool Whip/cream cheese creation. Teacups can be found at local estate sales, thrift/consignment/antique stores, and Craigslist. I bought mine at the Auctions while living in England. Ok, now that you have seen all of us, make sure you stop over at Monica Wants it. She has a beautiful, clean, and glam style that you are sure to love. 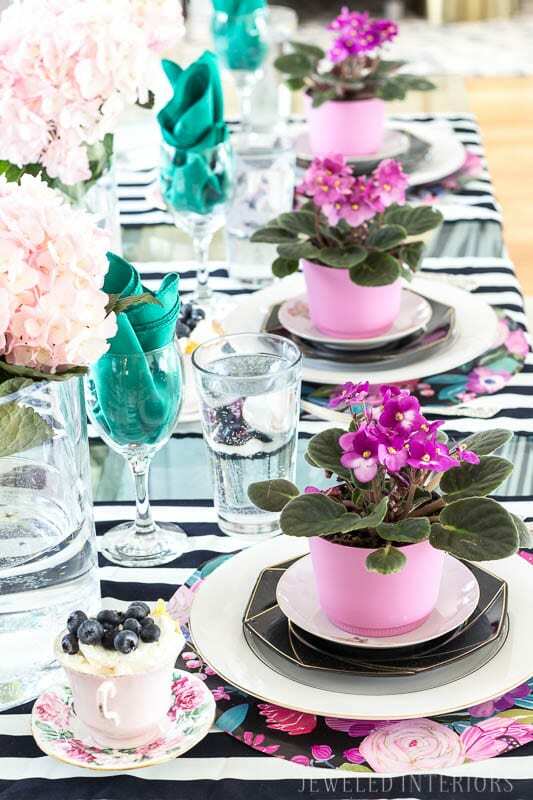 Thank you so very much for joining me on this Spring Tablescape Blog Hop. Like what you see? Feel free to follow me👇. GORGEOUS! I love your placemats- I have so much wrapping paper that I’ll have to steal this idea and whip out my circle cutter. It looks so good! I love your inexpensive charger idea! It reminds me of my floral DIY chargers except yours are so much more glam. I also like how you explained things! Thanks Monica! I LOVE your tablescape too! Thanks Jess! Your “Bar” is amazing! I’m just amazed how put together your spaces are! It looks like you’ve lived in that house for years! 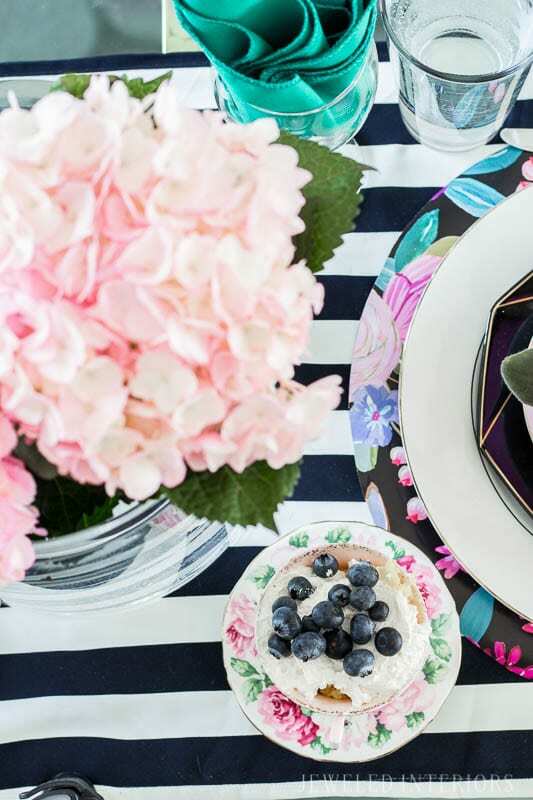 Love the Kate Spade inspo and such practical and beautiful tips for spring flowers. 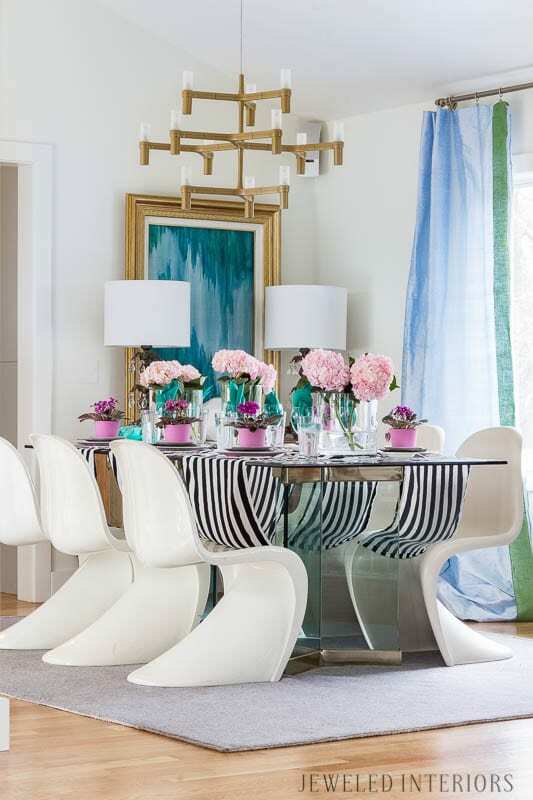 Gorgeous table setting in a gorgeous dining room. Do you know were you are going next? Thanks Kathy! We have heard rumors…good rumors. Our plan for a lunch date may just work out…Nothing official. 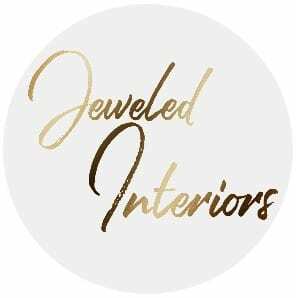 Jewel you continue to amaze me chica! I love your style and color combinations. It’s super chic and a nontraditional take to spring which I absolutely love. 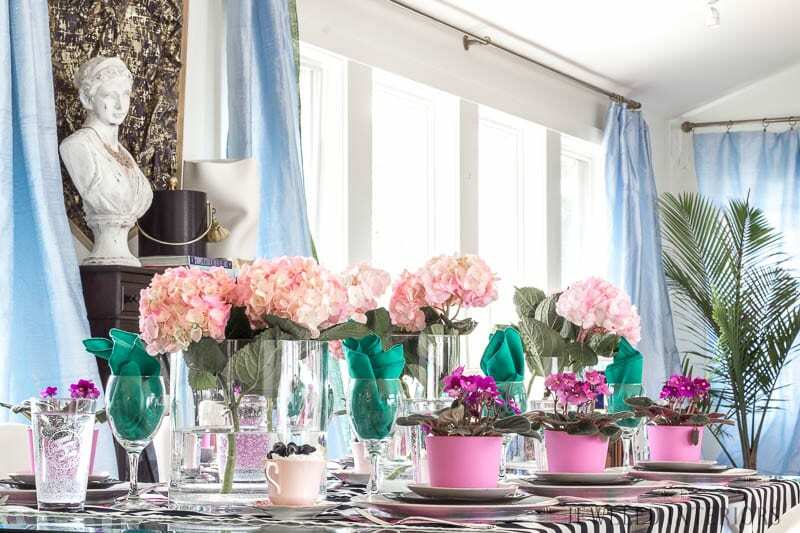 Stunning tablescape! Thanks girl! It was fun and easy to do!